It's the wedding you never thought you'd see! The Batrimony is real as Bruce Wayne and Selina Kyle are set to tie the knot in a can't-miss, extra-length milestone issue that will reshape Gotham City. All their friends (and a few enemies?) will be party to a comic book coupling for the ages. Superstar scribe Tom King officiates the sure-to-be-offbeat nuptials, joined by an all-star lineup of guest classic Bat-artists doffing their hats to the lucky couple in a series of pre-wedding flashback scenes sure to set the romantic mood. FINAL COVER MAY VARY. ALLOCATIONS MAY OCCUR. 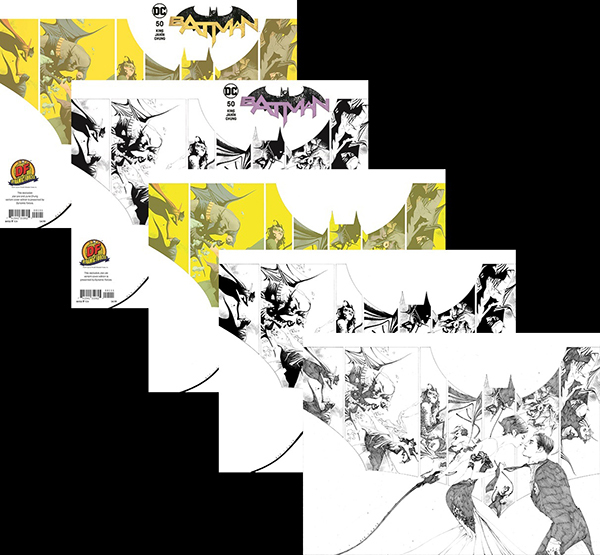 Package includes all 5 DF exclusives including the ULTRA-RARE PURE PENCIL SKETCH VARIANT and BLACK AND WHITE VIRGIN VARIANT! BATMAN AND ROBIN #38 FLASH 75 VARIANT GOLD SIGNATURE SERIES SIGNED BY PETER TOMASI!